I listened to my dad talk for 20 years about George Best and Pele and Cristiano Ronaldo is easily the equal of those. What sets Ronaldo and Barcelona's Lionel Messi apart is that they deliver on the big occasion. We aren't talking about the two best players in the world, we are talking about the two best players who have ever lived. I think that's how good these two players are. They take you to places no other player in the world can - and on Tuesday we saw a phenomenal performance from Ronaldo. You are talking about someone who scores left foot, right foot and he is fantastic in the air. The way he can control the ball with both feet, the speed at which he runs - at 32 years of age he has just scored a hat-trick in a semi-final. Ronaldo and Messi push each other on. Messi got all the plaudits after the recent match against Real Madrid, but Ronaldo has raised the bar again. Every time I see him I am amazed at his drive and determination to be the best in the world - and on Tuesday it was a 'wow' performance from him. He has natural ability coupled with hard work. He is a tremendous example of where hard work can take you. When we were at Manchester United he said he wanted to go on to be the best player in the world. He had the self-belief to get to the very top. I look at Chelsea's Eden Hazard sometimes and wonder if he has that. United's Carrington training ground is maybe a mile, two miles around. Every single day he used to take a ball after training and run and do his tricks for a mile, two miles at a time. His drive and his ability to practise every single day is just phenomenal. When he gets back to his house after the match against Atletico, he will have an ice bath, eat the right things at the right time to refuel his body, stretch - and he will have a masseur there. His professionalism, drive and desire are amazing. I read an article before the second leg of the quarter-final against Bayern Munich and it was very scathing. It said he had lost speed and was not a team player - but he scored a hat-trick against Bayern. His form is not dwindling. If anything it looks like he is getting stronger because he is being managed well. He has been rested well by Real boss Zinedine Zidane, and look at the sharpness and speed he still possesses. He is a physical specimen, a total athlete. Real Madrid were far too good on the night - they could have been 3-0 up at half-time and the man of the moment got three goals on the biggest stage. Atletico Madrid cannot play at the level Real did. They played like a team that did not believe they could go to the Bernabeu and win - they were cautious, poor with their passing and there was no belief in their body language. I have watched Atletico boss Diego Simeone a lot this season and he looks like someone who is coming to an end at the club, that he cannot take the team any further. He has got a big decision to make at the end of the season and it would not surprise me if he left to go to the Premier League or to Inter Milan. I talked before the match about what big occasions Champions League semi-finals are - but for Real it looked like a normal game of football. 52 - Ronaldo's hat-trick meant he became the first player to reach 50 goals in the Champions League knockout stages. 13 - Ronaldo has now scored 13 semi-final goals in the Champions League (10 for Real Madrid, three for Manchester United) - the most by any player, including when the tournament was called the European Cup. 103 - The Portugal international has also scored more Champions League goals than Atletico Madrid's 100. 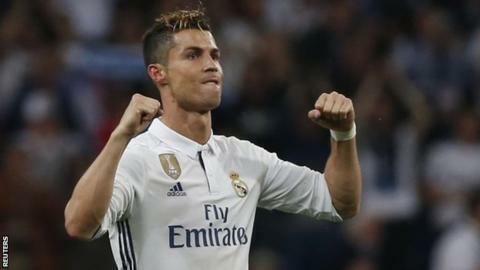 7 - Ronaldo has equalled Barcelona forward Lionel Messi's total of Champions League hat-tricks. 8 - He has scored two consecutive Champions League hat-tricks, and eight goals in his past three games in the tournament. 399 - The 32-year-old is one strike away from 400 goals for Real Madrid alone. After his match-winning performance on Tuesday, Ronaldo said: "It was a total team match. "We have a good advantage, but this is not closed. Atletico are very strong, they are not in the semi-finals by chance and we have to concentrate on Wednesday." On his ovation from Real fans at the Bernabeu, he added: "I just want you not to whistle me. Otherwise, I will always try to give everything for them." Fissuh Hailu on #bbcfootball: I couldn't agree more, Phil Neville. Ronaldo is up there with football gods and kings, whatever you call them. Absolute legend. Muscab Ali: Ronaldo is a good goalscorer but he is not at the level of Messi. There is a difference between an eagle and a falcon. Antony Short: Messi or Ronaldo, who cares? Let's just enjoy it while it lasts.